In 1935, under the Paper Currency Act of 1861, the Raj was granted the monopoly of issuing notes, ending the practice of private and presidency banks. But these currencies continued to be in use till the RBI issued its own coins and notes. Interestingly, till about 50 years ago, other currencies besides the RBI’s existed in, for instance, Portuguese Goa and Hyderabad. The central bank’s first currency, issued in 1938, was a five-rupee note bearing the portrait of King George VI. This was followed by notes of 10, 100, 1,000 and, yes, 10,000 rupees. In the subsequent years, global developments, security concerns and the high cost of minting money led to many changes in the motif and the material of the currency. In 1940, the one-rupee note was reintroduced as a wartime measure. The watermark was made more difficult to copy and the security thread was introduced in 1944 to counter high-quality forgeries of rupees by the Japanese during their assault on Burma in WW II. There is no uniformity or regularity in the change of colour, security features or pattern. “It isn’t wise to change the design and features frequently as it inconveniences people. At the same time, to prevent forgeries, we can’t keep it constant,” says Alpana Killawala, the RBI’s chief general manager. The George VI series continued till 1947. After Independence, a new design one-rupee coin was released in 1949. After careful consideration, King George VI’s portrait was replaced by Asoka’s Lion Capital, though a portrait of Mahatma Gandhi was initially considered but rejected. In 1960, the Hirakud dam, a symbol of India’s industrialisation, replaced the elephant motif on the Rs 100 note. During the first decade of Independence, the rupee was divided into 16 annas. Each anna was subdivided into either four pices or 12 pies. The Anna Series, introduced on January 26, 1950, was the first coinage of the Republic of India. It was continued for seven years, and then replaced with the decimal system, which divided the rupee into 100 naya paise. High inflation led to change in the metal for coins—from silver to nickel to aluminium to steel. Similarly, the paper currency has undergone a sea change—the economic crisis of the late 1960s led to a reduction in the size of notes and fears of black money in circulation led to the cancellation of high denomination notes like the Rs 1,000, the Rs 5,000 and the Rs 10,000 in 1978. But in 2000, the Rs 1,000 series were reintroduced with optically variable ink that changes colour on tilting. Given that the lifespan of a currency note is generally only two years, many of the paper currencies, such as the Rs 1 and Rs 2 notes, have now been phased out. The five-rupee note is due to be phased out too. 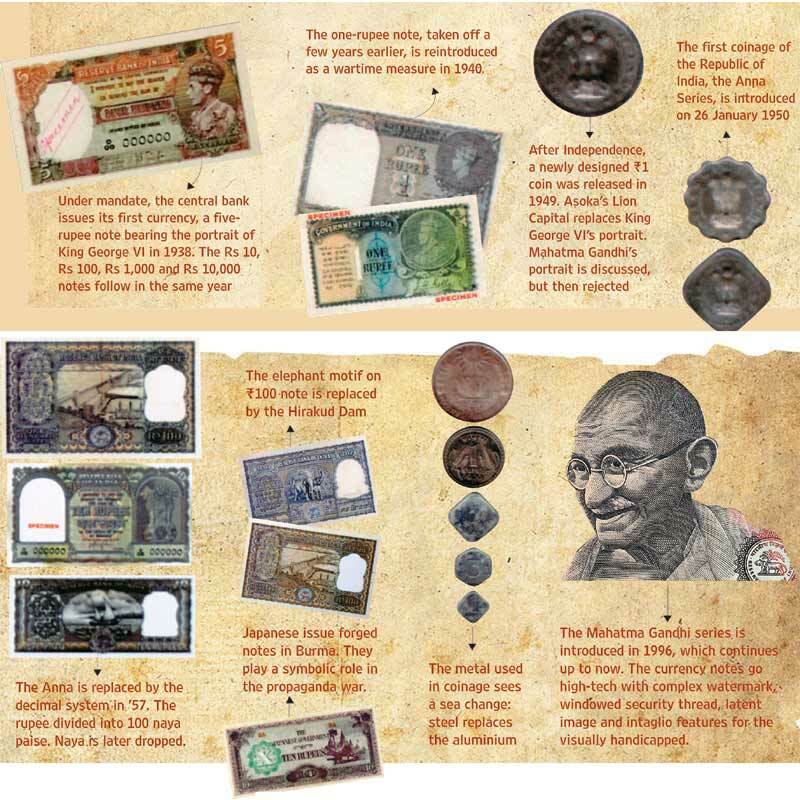 The coins and notes of today are all part of the Mahatma Gandhi series that came into use in 1996. The currency notes have complex watermarks, windowed security thread, a latent image of Gandhi and intaglio features for the visually handicapped. Further enhancements in 2005-06 raised intaglio printing and widened the security thread. The lure of this must-see history of the rupee will be difficult to resist. 150 rupee coin in India soon For the first time in the country's minting history, government will issue coins of Rs. 150, marking the number of years of taxation in India. The history of indian rupee is really interesting. When you explore the evolution of the rupee it is mind-boggling. Is there anyway to purchase some of the old Rupee notes? Please let us know the cost and what is available to buy.